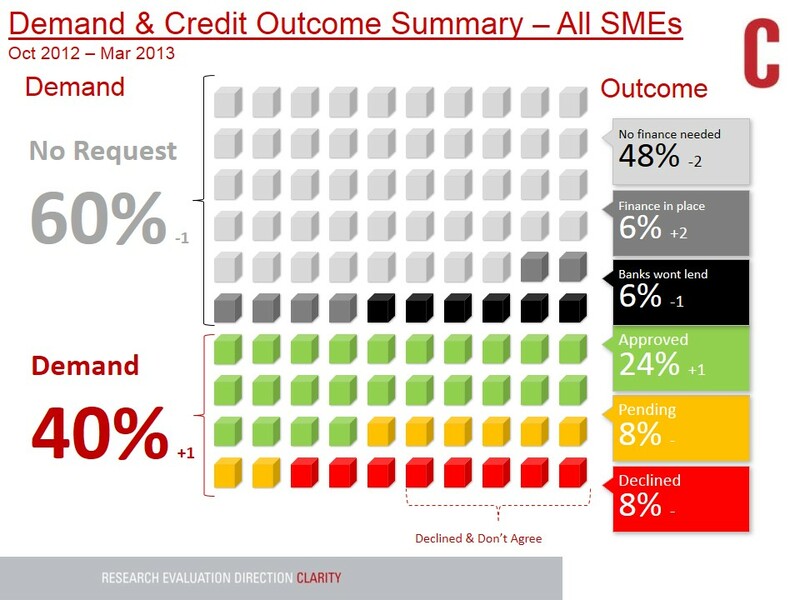 The results from this period’s Credit Demand Survey show that SME credit demand, while remaining low, continues its gradual upward trend. This is helped by a backdrop of continued stabilisation in the marketplace, driven by improved trading conditions for larger SME’s. The overall decline rate remains unchanged, at the level recorded in September 2012, but positively more loan applications are approved in full rather than partial approval. While demand itself has yet to improve significantly, there has been a positive improvement in the perception of whether banks are lending to the sector or not. A significantly higher proportion of SMEs feel that banks are lending to a small number of SMEs, rather than not lending at all. This improved lending sentiment should lay the ground for the potential for increased demand in the next six months. Yet, the belief that banks are not lending remains an issue, with a significant minority (6%) of SMEs not applying for credit because they believe the banks are not lending. Micro companies in particular require more help, with those who have looked for credit having done so more informally, and perhaps more needs to be done to encourage formal applications from smaller companies. Time taken to process credit applications, and ensuring the reasons for decline are clearly understood by the applicant, remain key areas for the banks to focus on in order to further encourage demand in the future. While awareness of the code of conduct sees a positive increase, it is also a small concern that the overall awareness of the Credit Review Office, set up for those who are refused credit by one of the pillar banks, has decreased.